NO matter who crosses the finish line first, history will note this year's Gold Coast 600 as the end of an era. 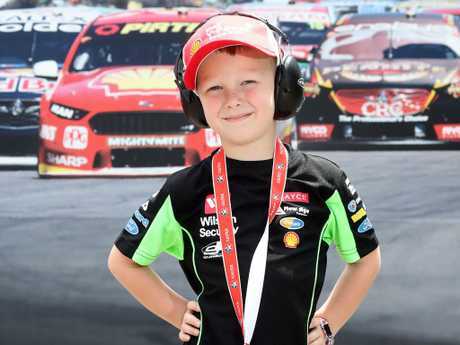 The event is a chance for fans to farewell one of the sport's true living legends, Craig Lowndes, as he undertakes his final race as a full-time driver. It's also the last year race weekend will feature two 300km Supercars Championship rounds before the new Gold Coast 500 endurance format debuts in 2019. It's perhaps why fans turned out early and eager on Day 1 as the sun finally returned to its rightful place after one very wet Gold Coast week. 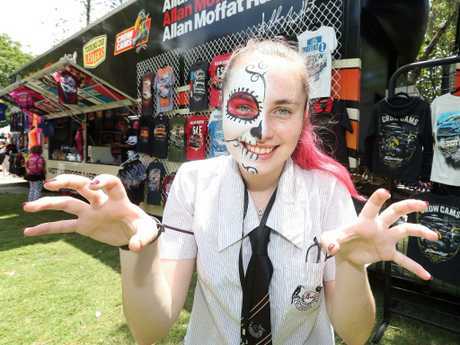 Friday at the GC600 has become the unofficial traditional day of students, families and motorsport fans on wheels. 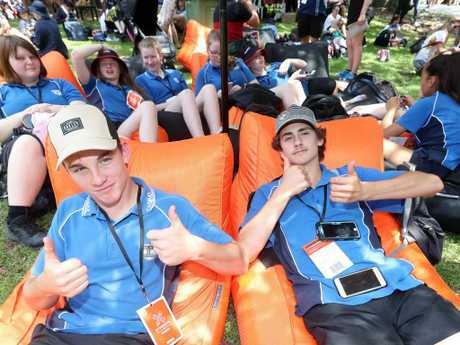 Parents pushing prams and sweating buckets, racefans in team colours and wheelchairs and teachers with gaggles of excited students in tow ruled the paths that weave through McIntosh Island on Day 1. The day without queues. "We've got more than 5000 students here today," Supercars COO Shane Howard said. Testament to the work the council carries out between races each year, the track precinct is in ship shape after last week's unprecedented wet and windy lead-in. Tourism Minister Kate Jones and Supercars Australia CEO Sean Seamer thanked the army of paid and unpaid workers who helped prepare the precinct in such challenging conditions. "Can I say thank you to all the volunteers - more than 750 volunteers - that have worked day and night to get this track up and ready for race day given the extraordinary amount of rain that we've had leading in to this event," Ms Jones said. "We are so excited with Supercars this year. We expect the economic impact this year will break more than $46 million. "They have an extraordinary lineup of acts both national and international including Sheppard and of course, one of my favourites Live." The Minister missed her big chance when Live rocked up trackside moments after she left. 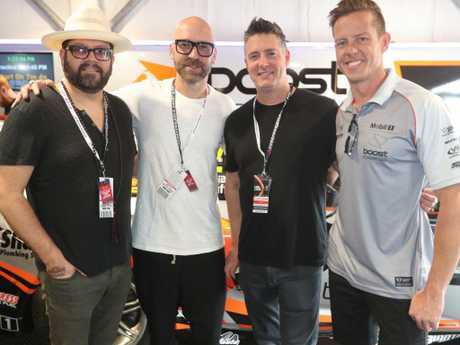 Gold Coast Socceroos player Michael Thwaite, who now calls Burleigh home, made his motorsport debut when he called into the Nissan Team Garage to present mad football fan and Supercars driver Michael Caruso with an autographed Socceroos jersey. "He's based in Melbourne so I think he's a bit torn between Melbourne and Sydney," Thwaite said. "This is my first time but I'll definitely come again now that I've made it. I think we need to do more cross-promoting in sport." 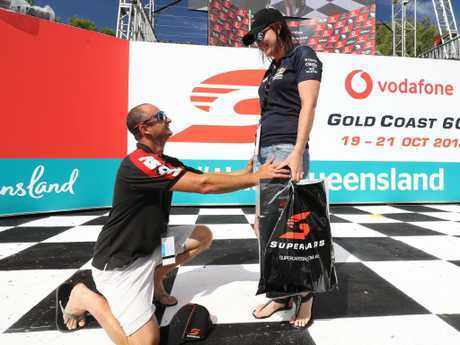 Day 1 also turned up this year's first marriage proposal after a fan jumped on the podium and fell on bended knee (she said yes!). Corporate suite guests poured through the gates like excited children, ready to dine out over an afternoon drive or two. In fact, demand for corporate experiences is now so strong, the Gold Coast Suns chartered new territory this year with a roped-off suite on the ground under the trackside media centre. The event's new host with the most, Supercars Australia CEO Sean Seamer, charmed all in his wake as he made his GC600 debut with his frank and friendly style and promise of bigger and better things to come. "Interestingly, when we talked about the calendar for next year - there's a tremendous amount of change and innovation in it - but the format of the Gold Coast is one of the things that's been asked about the most," he said. "Which I think is an indication of how popular the event is and how welcome that format change (next year's GC500) has been for fans and for the sponsors." Mr Seamer's challenge is to ensure the race remains a favourite for motorsport fans as it looks to boost its wider appeal. "We're putting ourselves under pressure to be able to deliver a broader experience for more people and that's where we have to innovate - not just on the track," he said. "A new category will help with the race fans but we want to do a better job off-track as well. "This is seen as the party round so we've got to lift every year and do something bigger and better because people expect it. "I know what it's like. I was living in Singapore at the time both pre and post the F1 race launching there and you know, you've constantly got to push yourself to be better than what you were last year - and we are." 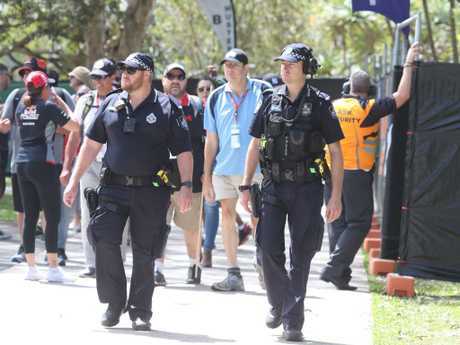 Mr Seamer said organisers were also looking at ways to boost the GC600's sold-out corporate facilities, most likely by taking some of the existing buildings up another level. "From a corporate point of view we'll need to look at that (where to put more stands)," he said. "We've sold out this weekend, we've sold out grandstands. Grandstands are a little bit easier to add, corporate facilities need to be a unique experience. "For me, along the beach there is where you could start to do something interesting - particularly on a nice day like today, on the other side of the track down on the beach it would be great." Ah, the good old Goldie. A traffic jam one day, one of the world's most exciting street circuits the next.